I have just heard the most horrific University interview story. I interview everyone that applies for my course so I can meet them, they can view the facilities, occasionally meet the current students and sit an assessment test. It helps put them at ease and if they’re not suitable I’ll give them some advice as how to proceed should they wish to reapply at a later date. Today my applicant was telling me about an experience they had at a university (I won’t reveal names), which left them in a state of distress, crying and dreading the one with me today (she left here smiling and laughing). It was their first experience of an interview and when they arrived quickly found it was a group interview, where they had to display their portfolios in front of everyone. The applicant found this very humiliating, especially when the tutor said they didn’t think their work was up to much. To top it off they were further humiliated when their coursework documentary was played in front of everyone too. Then the person was interviewed by a final year student who sat and talked about himself. When finally they met a tutor, they were told they didn’t have the points to get on the course so needn’t have bothered turning up. At the end of this two and a half hour humiliation, the applicant said everyone else was being told they’d got a place and when they got to them, they simply said they couldn’t a decision and would send an e-mail. The person found the whole process soul destroying. There seemed to be no sense of how the applicant feels. It is a daunting experience to be interviewed by academics, but there are ways of letting someone down. I’m happy to say that person left my interview feeling very positive and upbeat. “Grimsby is the place they want to be”, which is nice to hear! Students at East Coast Media are fortunate that the department has good industry contacts. 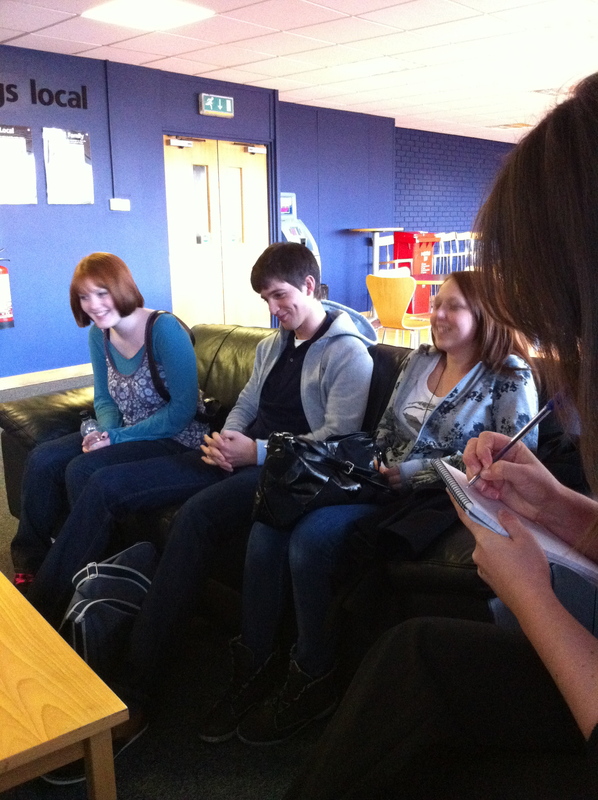 Over the years journalism students have done work placements at BBC Hull and the Grimsby Telegraph on a regular basis. The partnership with the local newspaper has now gone one step further. Final year students have always gone in for two to three weeks as part of one of their modules, but for the first time second year students are going in, but they are working in the newsroom for a day and a half for a year. The reason for this is for them to gain hands-on practical experience of life in a newsroom. To work alongside the professionals and get to understand how the newsroom operates. The students are working as patch reporters. In small groups they have been given three patches. It gives them the confidence and the experience to go and talk to people and find stories at grass roots level and it gives the newsroom extra pairs of hands. And if lucky, their stories will be published, not only in the paper but also online. The module they are being assessed on is called Multi-Platform Newsroom, so the students have to find stories and then translate them into different formats – online copy, photos, video and audio. They already have a website that they have been working on since October to showcase their work and talents for assessment purposes http://nelincolnshirenews.webs.com/ Any work gathered for the newspaper will be published there first before going on to this site. This is exciting for all concerned and while some out there may grumble about “working for free”, this is the only way these students are going to be able to get the practical, hands-on experience. It is not just about sitting in the lecture theatre reading books and taking notes. It is about getting into the real world and for someone to let go of your hand and push you forwards. Their first half day was spent in two groups walking down the length of Freeman Street (once the grand entrance to the fish docks and sadly now a run-down area) talking to traders and shoppers for the sole purpose of making contacts, getting a feel for the place and finding stories. Somehow the groups had split into male/female. The latter, I have to say, found five stories, while the boys found three. The competitive streak was very evident! They were sent out with notebooks and pads and had 1.5 hours to uncover things. The News Editor, Lucy Wood, already knew of three big stories down there and wanted to see if the groups would come across them (I have to say they did uncover two of them). I followed the groups to see how they were performing and to prompt when necessary. The boys I lost in Foresight, but I managed to catch up with the girls who were in and out of shops introducing themselves. I had to give one or two prompts with interview techniques, but it probably did not help having your tutor breathing down your neck or knowing she’s hiding in the shop listening to you. Everyone they met was friendly and approachable, which I think surprised some of them. They’ve made their first contacts and many traders invited them to come back and speak to them next week. Those first tentative outings will form lasting contacts (hopefully). Then it was back to the newsroom and the story writing process began. They also started to think about pictures to accompany their pieces and how they would cover it for a podcast and video. Deadlines are real and there’s no hoping the story will disappear if you’ve forgotten to ask someone their name – they’ve realised that one. “Phone them up” I’m saying. I’ll keep you updated on this experience and you can follow their antics on twitter @rosereiki or @eastcoastmedia. We’re lucky that the News Editor is very enthusiastic about this project and she’s also very keen to enhance the opportunities online with audio and video content.